The NSWCA was well represented at the Long Island Water Quality Symposium held 10.22.15 at Carlyle On The Green. Virtually all 21 NSWCA member Districts were in attendance, and the conference covered a multitude of topics pertinent to both Nassau and Suffolk counties via four panel discussions. Stan Carey, NSWCA’s LICAP representative and Superintendent of Massapequa Water District updated the assembly on recent efforts by the LI Commission for Aquifer Protection. Port Washington Water District Commissioner Mindy Germain was a member of the panel discussing “The Quantity of Long Island’s Drinking Water” along with Jane Barbato, Water Conservationist with the Jericho Water District. 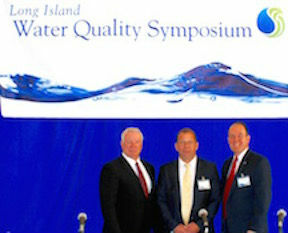 Former Oyster Bay Water Commissioner and current Nassau County Legislator, the Honorable Donald MacKenzie was part of the panel “What Your Elected and Government Officials Are Doing to Address Drinking water Concerns. Franklin Square Water District Commissioner Ralph Pugliese, also 1st Vice Chairman of the LIWC, delivered the closing address of the Symposium.